KJIPUKTUK (Halifax) - It is clear that the Halifax Pride Board is trying. Yesterday the group; often criticized by local queer and trans activists for being too corporate, out-of-touch and devoid of politics; announced its plans for the 2015 festival. Pride also released a new logo and website, all part of a new image. Key to Pride’s rebranding, the text-heavy cover of the 2015 Pride guide reads: “Happy lesbian, gay, bi, trans, queer, intersex, asexual, pan, poly, questioning, flexual, two spirit, allies, curious, gender-f*ck, fluid…” going on to list 25 different identities and descriptors. It ends with this year’s theme “It’s YOUR Pride”. 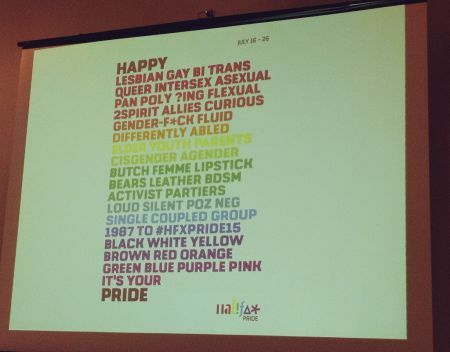 Fueled by a year of community consultation, the changes are meant to make everybody feel welcome at #hfxpride15, says Halifax Pride Chair, Willem Blois. “We’ve really enjoyed growing and we haven’t necessarily realized our commitment to the community to educate the sponsors as well and not just take the cheque,” says Blois. While Pride doesn’t have criteria for sponsors, the Board plans to meet with each funder. This year’s main (or “Rainbow”) sponsors are: TD bank, radio stations 101.3 The Bounce and C100, and Halifax Magazine. Representatives of these sponsors spoke at Wednesday’s launch. 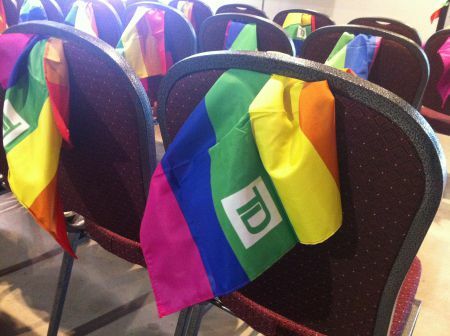 At the launch small rainbow flags branded with the TD logo were placed on each chair. TD, a Halifax Pride sponsor since 2010, touts its cross-Canada sponsorship of Prides and groups such as the Canadian Professional Association for Transgender Health, Egale and the Canadian Foundation for Aids Research (CANFAR). There are a total of 62 ads in this year’s Pride guide. Carmella Farahbakhsh, a staff person at South House gender justice centre, wonders what sponsors are doing for the community, before and after, as well as during, Pride. Last year’s most contentious sponsor, Tel Aviv tourism, has not yet registered for the community fair, says Blois. Last year, Pride organizers asked activists not to hand out leaflets near, or engage in discussion with people staffing, the Tel Aviv booth. Halifax Rad Pride activists were calling on Halifax Pride to join the global boycott, divestment and sanctions (BDS) campaign against Israel. The 2014 Halifax Pride Parade occurred during Israel’s renewed siege on Gaza. 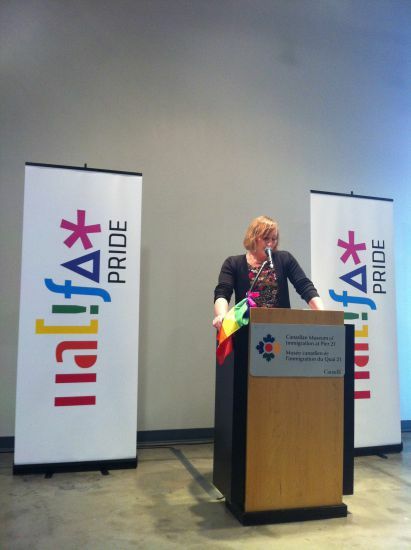 Jude Ashburn, a founding (and now former) member of Halifax Rad Pride, says that then Pride Chair Ramona Westgate told them Pride isn't the place for politics. Ashburn says Rad Pride didn’t receive a response to their final email to last year’s Board. Blois adds, “As we found out last year we need to keep closer track of how we vet people to [have a booth at the fair],” noting the Board will be reviewing Toronto Pride’s related policies. In a possible nod to queer and trans activists, Pride has chosen Kate Shewan to be this year’s Grand Marshall and included a welcome letter from LGBTQIA+ advocacy group Nova Scotia Rainbow Action Project (NSRAP) in the guide. Shewan, the current Executive Director of the Youth Project and former chair of NSRAP says she hopes that having “an activist and advocate as Grand Marshal will bring the spotlight to issues” such as bullying faced by LGBTQIA+ youth and the challenges faced by the transgender community. Shewan notes that while gender identity and expression were enshrined in the provincial Human Rights Act in 2012, trans people still face discrimination, including in the area of housing. Much of Thursday’s event revolved around a post Dykes vs. Divas gathering that will shut down parts of Gottingen Street to “reclaim space and celebrate our history”. Blois hopes that the event will showcase local LGBTQIA+ community groups as well as groups and services housed on Gottingen Street. “From the feedback we received from the survey, people wanted to get back to their roots, more justice, more history, more activism,” Blois says of the gathering. “We don’t have a big activist background as Board members but we knew that there are people in our community who are very apt at serving that role so we wanted to create an event where they could come out.” The event, confirmed two weeks ago, was not specifically designed to engage Halifax’s racialized communities, but Blois hopes that it has that effect. Farahbakhsh notes that this event is happening while the North-End is gentrifying, something the Pride Board will need to address. 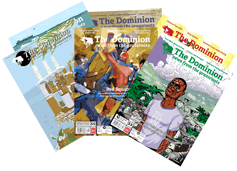 “I don’t think that it [rebuilding community and connection with queer and trans folks of colour] is something that can happen within one year or with one rebranding,” says Farahbakhsh, noting a legacy of mistrust. Farahbakhsh hopes for more community consultation.